Install one of the most reliable forms of protection with a prison mesh fencing system. Built from the most sustainable materials, our high security mesh fencing system combines a flat prison mesh fence panel with a heavy-duty box section steel fence post. 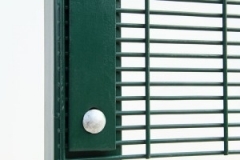 The prison mesh panel consists of wires welded at each intersection and set out in a pattern that allows excellent see-through visibility whilst remaining extremely secure. 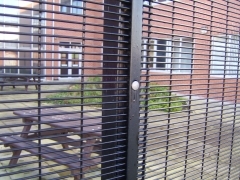 Taurus '358' Secure Prison Mesh Fencing is one of the most durable systems around. Priced and sold per linear meter and each prison mesh system is supplied with 1x 2.5m wide panel, 1x 60 x 60 Box section post, and is complete with clamp bar and fittings. 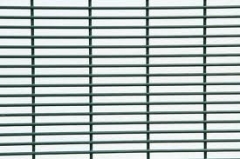 Our prison mesh fencing is available and stocked in a powder coated green finish RAL 6005. However, other colours are available, so please contact our store for prices or give us a call directly on 01204 578012.